I always get a little nervous when a friend sends me a book, especially if it's one that they really loved or worse, that they've personally had a hand in. I can't help thinking, what if it's awful? So you can imagine the mixture of fear, appreciation and curiosity with which I approached Coming Home: Stories from the Northwest Territories, an anthology of contemporary northern writing sent to me by my friend (and beacon of all things literary) John Mutford. The fact that John was one of the two people who selected these stories for the anthology only added to the apprehension. It actually took me a half year to crack the cover. Happily, the writing in Coming Home is fresh and vibrant. For many of the authors included in this collection, it is the first time any of their work has been published. Theirs are important new voices in the Canadian literary landscape. With a few exceptions, most of my experience with northern writing has been of the historical Farley Mowat/Jack London variety, tales of hardy men who moil for gold and all that. So I was particularly intrigued by the stories in this collection that showcased contemporary life in Canada's north. I have often pondered the realities of isolation, in this age of uber-connectivity, in those small pockets of community scattered throughout the vast north. These stories, most of them admittedly works of fiction, have gone a long way to filling in the blanks of my understanding of northern life. Particularly refreshing to me were the stories told from the perspective of teenagers, women and aboriginal people. Not unexpected in a collection that contains many new writers, I did come across the occasional phrasing that felt forced, that jolted me temporarily out of the story. But these lapses, these reminders of the author's inexperience, were surprisingly rare. For the most part, the stories in Coming Home were skillfully wrought, and I look forward to hearing more from these authors. 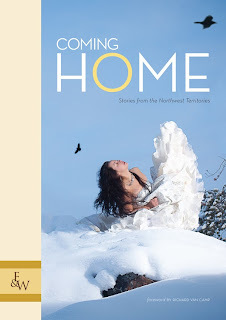 Coming Home: Stories from the Northwest Territories is split into two sections: eleven works of fiction and six of non-fiction. Each piece is post-scripted with a brief author bio, which I really appreciated. In fact, I found myself anticipating the bio as I read each story, curious to learn more about the person who penned the words. This anthology is highly recommended for anyone with an appetite for stories that you don't hear very often, stories of contemporary life in the Canadian arctic. Thanks, John! It's a good lesson, John - always be part of a selection committee. You two did a great job of selecting stories for this book. I have this on my TBR list and one of these day's I'll get my hands on it. The few reviews I've seen all make it look like a good read.